Tamil Nadu recipes offer wide variety of delectable food to suit anybody's palate. Tamil cuisine offers three types of food - The Chettinadu, Kongunadu and Nanjil Nadu cuisines. Among them, the most popular one is the mouth watering spicy Chettinadu cuisines. Kongunadu cuisine is much milder, and more fish and coconuts are used in Nanjil Nadu cuisines which is influenced by the neighbouring State Kerala. 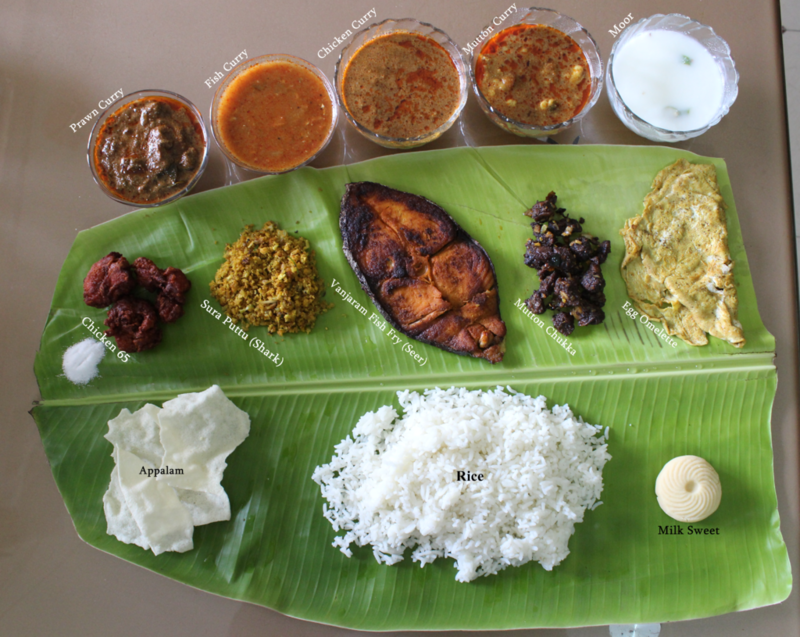 The Chettinadu cuisine is originated from Karaikudi and Madurai, Kongunadu cuisine is originated from Coimbatore, Kangayam, Erode and Pollachi, and Nanjil Nadu cuisines from Kanyakumari. In Kongu cuisine, you can get food like spicy biriyani, naatu kozhi curry etc. The mutton pallipalayam is the signature dish in Kongu cuisine. Masala dosai is made from the fermented batter of rice and black lentil, stuffed with lightly cooked potatoes, fried onion and spices. It is eaten with coconut chutney and very delicious. Varities of Dosai are made such as plain dosai, set dosai, rawa dosai, wheat dosai, onion dosai, green gram dosai, multi grain dosai etc. They too are eaten with coconut chutney and/or sambar. Idli is made from overnight fermented rice and black lentil batter. They are steamed and soft, and usually served with coconut chutney and sambar. The main ingredients of Ven Pongal are rice and moong dal. It is one of the most popular breakfasts of Tamil Nadu and very delicious. This is made from rice batter and looks like a pancake laced with spiced onion mixture. Roasted semolina is the main ingredient for this recipe eaten with sambar. Sambar is one of the most popular main dishes of Tamil Nadu. It is made with Tur dal and two or three vegetables, added with tamarind and the special masala called as sambar powder. It is used with rice, dosai, idli, ven pongal etc. This is made with okra (vendakkai) as the main ingredient with small onions (shallot) and tamarind water, with or without coconut. The masala powder made at home for this tastes special. Rasam is another main dish used with rice. It is made with tamarind, tomatoes, pepper, cumin, garlic, lentils etc. If papad is also served with rasam it makes a fabulous meal. Ash gourd (Sorakkai) is the man vegetable used here. Coconut and cashew nut paste, and other masala added to this, makes it much demanded item. The famous Chettinad Vellai Kurma is one of the most demanded dishes for chapathi and rice.